Flipping through the pages of Ravelry the other day, I was blown away by this sock. 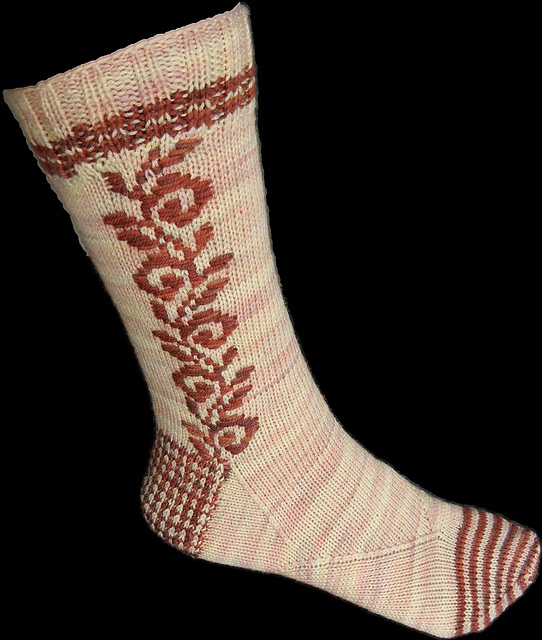 Roosimine is a free sock pattern by Caoua Coffee. The technique is from Estonia and is called Roositud. It is not Fair Isle color work by any means. Instead it is more like needlepoint and crewel work put together. The pattern describes the technique perfectly. But if you are a visual learner you might want to check out this Knitting Daily clip of the process here. Of course I am dying to make these socks, but first I have projects that need finishing. I am on the button bands,cuffs and collar of the girl’s coat I am sample knitting. Then after that is complete I must turn my attention to the blanket for Dad, which I’ve woefully neglected while working on the sample. It looks like the finish date for the blanket will be sometime in October. I say that with fingers crossed because I need to order more of the blue yarn, which I hope is not on backorder. Then I can knit these socks. I love playing with new knitting techniques. I haven’t been this excited about a pair of socks in a long time. They are just the motivation I need.